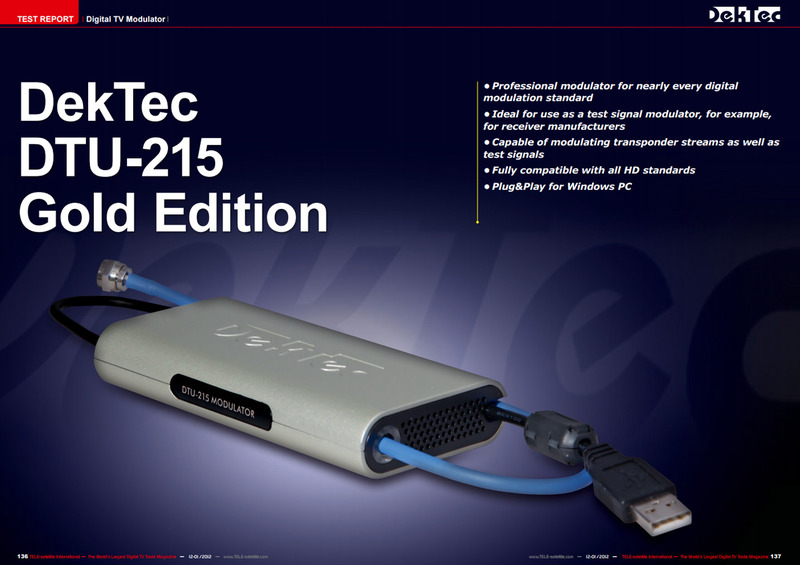 The DTU-215 is a portable modulator for terrestrial and cable standards. By it's USB powered design and a comprehensive channel-simulator, including AWGN and Multipath echo, it is a true fully-featured and easy-to-use multi-standard modulator for demonstrations and R&D. Cable/terrestrial modulator for USB-2 with StreamXpress player software. Cable/terrestrial modulator for USB-2 with all current and future modulation options, channel simulation and StreamXpress including remote control. The base version of the DTU-215 supports the modulation standards listed under "Modulation standards" at the top of this page. Please refer to the Modulation Options page for all available options. USB-2 based multi-standard modulator with support for most QAM-, OFDM- and VSB-based modulation standard. Powered from the USB-2 bus, so no external power adapter is required. Direct digital conversion to 47..1000MHz for excellent signal quality. Playout of I/Q sample files up to 9.14Msamp/s. DekTec's general purpose cable and terrestrial modulator for PCIe. The DTA-2111 and DTU-215 share the same set of modulation standards, the same frequency range and an all-digital modulation and upconversion architecture. All-standard all-band modulator for USB-3, including satellite and ATSC 3.0 modulation. The DTU-315 also operates from a single USB-3 connection supplies power, real-time data and control. The DTU-315 requires a USB-3 port.